Galactic: Kids Next Door teaser trailer. to the world's operatives was to build a website to launch it on. But we didn't want to make it easy for evil adults to find it. So we decided it needed a secret g:KND log-in. would need their own universal alien font. I mean... that's Guy Moore's jam. to make new lines and dots. SO many lines and dots. GALACTIC KIDS NEXT DOOR ALPHABET AND NUMERICAL SYSTEM. DO NOT ATTEMPT TO ADJUST YOUR BROWSER. I’ve been fascinated with letters and symbols all my life. and sight-read their responses without using the key. J.R.R.Tolkien’s Tengwar runes, the ones used to write Elvish. and working with fonts and typography of all sorts. 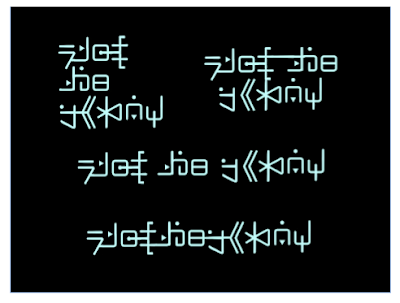 So when Mr. Warburton said he needed an “alien font” for GKND, I was stoked. But then he said, no, he didn’t want English. 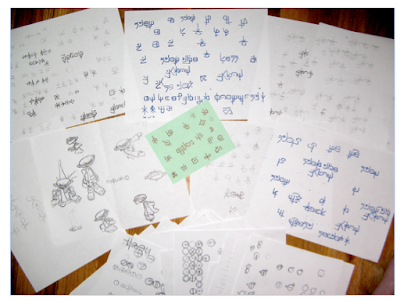 He wanted made-up alien letters, just like those ciphers I made as a kid. cool-looking sci-fi anything is the work Syd Mead did on Tron. 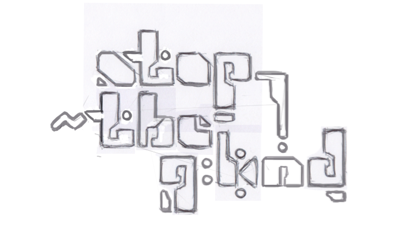 kind of ice-blue line and rounded corners for the letters. whenever I wasn’t doing anything else. On 8.5 x 11 sheets of white Xerox paper. 1) The characters needed to be easy to draw, with a minimum of strokes. if you’re not too particular about hitting every corner perfectly. 2) The characters needed to have a common design thread. common base and height lines, etcetera. or a triangle of roughly the same size as the square. that they could be quickly distinguishable from each other, even at small size. in ways that were interesting, and would make them more alien. Q and U, T and H, and other pairs of that sort were designed to work with each other. It satisfied Mr. Warburton, too. because that was the only character we knew for sure was needed. when we italicized it was just good fortune! The numbers were a different challenge. to also apply to whatever digits we created. But that rapidly got tricky beyond 6.
of being quick to write and easy to read. and to avoid plagiarizing Richard A. Watson’s square-framed D’ni numbers. rather than listing more digits. ditto for millions, once you had its flag. just as quick and easy to write as small ones. We went around and around on whether the system should be Base 10 or Base 12. Base 10 would slow them down a little. because 13 marked the advent of Teen status and Decommissioning. because we wanted everyone to be in on the fun. Our favorite characters are from Earth, and use Base 10. The show is watched by Earth people (as far as we know) who use Base 10.
would be in good shape, but nobody else. which made sense and gave us even more variety, so we kept that. 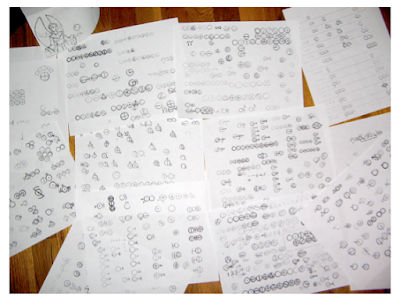 was Base 12 and pictographic. 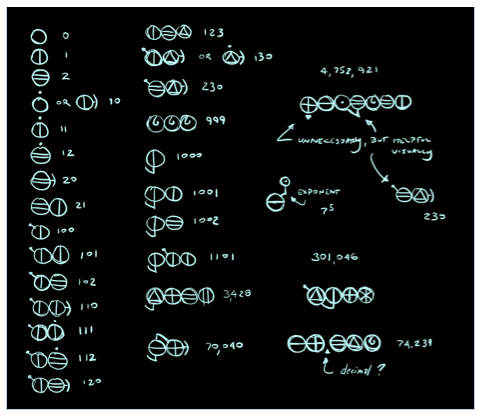 flexible notation capable of advanced mathematics. 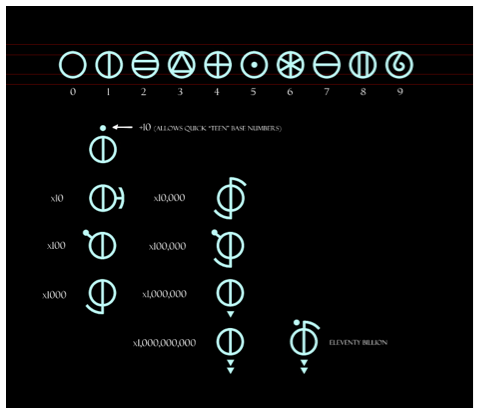 but retains some of the old Base 12 pictographs, and a variant of the Teen notation. before her human disguise goes on the fritz. 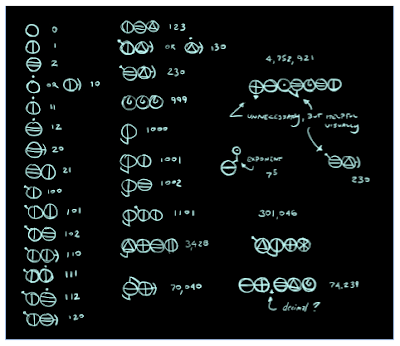 but any further mathematical symbology or notation has yet to defined. Wow! That process is really cool! I hope to hear more about the making of the G:KND! It is so interesting. That's so cool and amazing. Glad to know what the last few letter are. Can't wait for more news about it! That's pretty impressive. 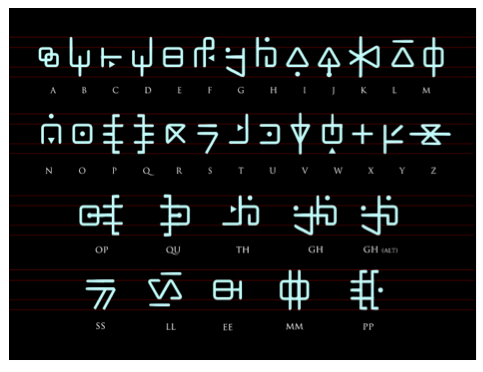 I wouldn't mind trying to learn this language. this alphabet should get extended , we need a full alphabet .